The humble bee has found itself at the centre of global concerns about the future of the environment. So concerned are experts about the demise of bees that they predict their loss could spell disaster for the food chain due to their important roles as pollinators. So why, when bees are such an important part of the natural world, are they being targeted on the doorsteps of homes around the country as a pest? Yes, no-one can overlook the fact, that as wonderful as they are to the world of nature, bees can sting. And with invasions of angry wasps driving fear into the hearts of children everywhere, it is inevitable that the buzzing of the significantly less angry bumble bee, or honey bee, will also cause alarm for youngsters. And no family wants their child frightened to go outside. But is destroying their home, or, even worse, killing bees the best course of action to take? We would say definitely not. So, what is the solution – should bees make themselves at home on your property? If at all possible bees should be left well alone. Although a swarm of bees can be an intimidating sight, bees are unlikely to sting unless provoked. Obviously, this is not always the case, and should a bee head your way the best advice is to stay as still as possible until it flies away. Bees cannot usually be moved, and herein lies the problem as the only remaining solution is to use a chemical to destroy the nest. This course of action is devastating when calls are being made to protect bees at all costs. Bees only set up home for a relatively short period of time – usually just two months. Bumbles bees often live underground in holes, but can inhabit sheds or compost heaps. They usually keep themselves to themselves and live in relatively small numbers with nests often not containing more than 100 bumble bees. Honey bees, however, can make their homes in walls, trees and lofts, but the real problem is the numbers in which they nest with as many as 40,000 bees in a colony. Like bumble bees, honey bees should be left alone where possible, but if they pose a threat to public health it might be that a chemical solution is the only alternative. The best solution all round is if we allow bees to be a friend to our garden. 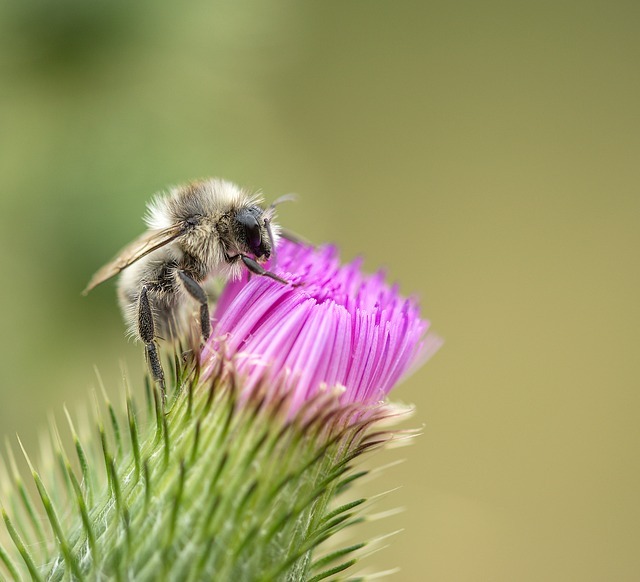 Plant bee-friendly plants and craft a bee hotel for solitary bees and help to protect the vital role these hard-workers do to bring harmony to nature. For more advice on what to do regarding bees’ nests contact Pest Busters.